On June 19th, the wives of the Israeli and Japaneste Ambassadors to Washington, Mrs. Sally Oren and Mrs. Yoriko Fujisaki, visited IsraAID programs in Japan's Tohoku region which was devastated by the last year's Tsunami. The senior diplomats' wives, who are also close personal friends, attended a Post Trauma training workshop for kindergarten teachers in Shinchi-machi, led by Israeli music therapist Ayala Gerber-Snapir. Oren and Fujisaki were greeted by the mayors of both Shinchi-machi and the nearby Watari-cho, cities where IsraAID arrived just weeks after the disaster, and has been operating in ever since. The mayors thanked IsraAID for its ongoing support to the people of Japan, and requested that this message be conveyed to the respective embassies. During the session in Shinchi-machi, Mrs. Sally Oren, previously a dance teacher, taught 40 children and 8 teachers an Israeli song and dance called 'Sim Yadcha Be'yadi' - put your hand in mine. 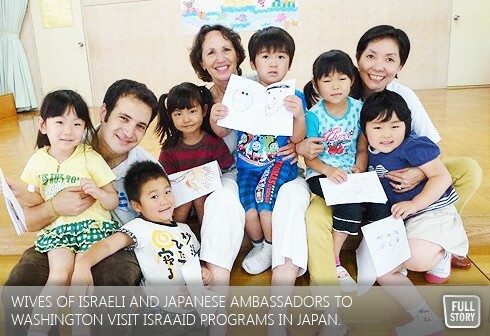 Of the visit Mrs. Oren remarked "I am so thrilled to have taken part in this IsraAID project in Japan. The profound impact on the children is obvious, and I have been personally moved by the experience." Mr. Yotam Polizer, IsraAID's Japan Country Director, was delighted with the diplomatic visit and thanked Oren and Fujisaki for coming: "It means so much to us, and to the people of Tohoku. Visits like this one give us the strength to continue and support the people of Tohoku for years to come". IsraAID arrived on the ground in Japan less than 4 days after the March earthquake and ensuing Tsunami. While initial efforts went into distributing vital relief items, IsraAID quickly shifted its focus to the mental needs of tens of thousands of tsunami survivors. Today, IsraAID is active in 8 cities, and is training nearly 1,000 educational professionals from the Miyagi and Fukushima prefectures of Tohoku. UJA Federation of Greater Toronto is the world’s largest financial supporter of IsraAId.